EUR/USD has broken out 1.1717 upwards and is now under pressure. Practically, in the market there still is a possibility of a correction to 1.1800.Today, we expect a new consolidation range with the growth to 1.757 and then with the fall to 1.1717. After that, it may rise 1.1800. Here there will be no more potential for correction. 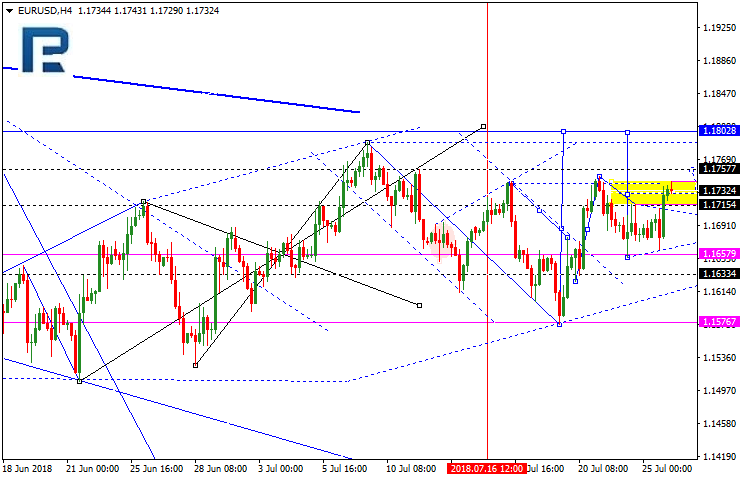 Then there is a downtrend to 1.1400. 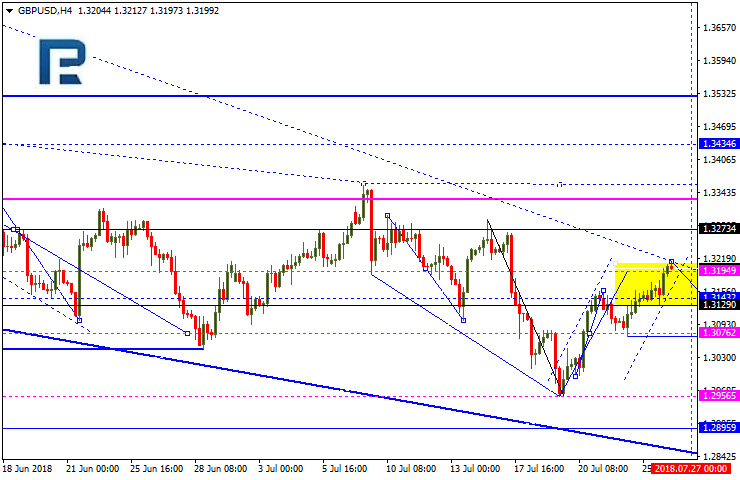 GBP/USD has reached its upmove target.Today, it may fall to 1.3075 and then rise to 1.3140. After this the new consolidation range may be expected. In case of a breakout downwards the price may reach 1.28888. In case a breakout upwards occurs, the price is likely to go up to 1.3230. 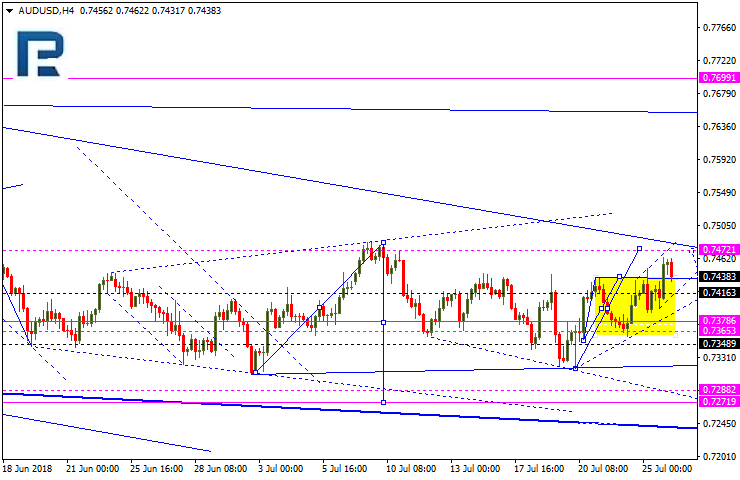 USD/CHF continues to strengthen. 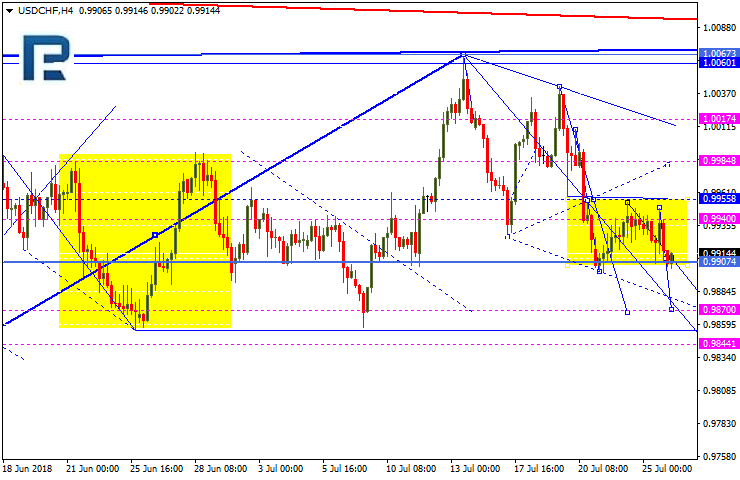 In case a breakout downwards occurs at 0.9900, the price is likely to go down to 0.9870. If the price goes up, the growth to 0.9990 may follow. 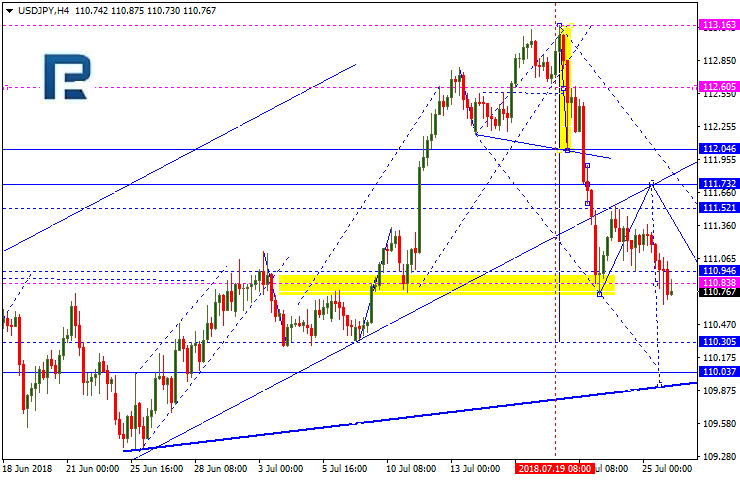 USD/JPY has broken out 110.95 downwards and continues to go down with the target at 110.30. 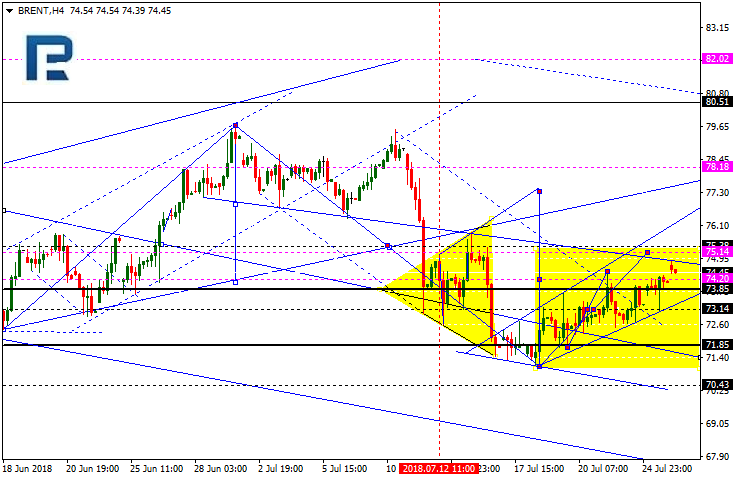 After reaching this target we can expect the correction towards 111.73. AUD/USD has broken out 0.7430 upwards. We can expect it to grow up to 0.7472. Here there will be no more potential for growth. Later, it may fall to 0.7285. This is a strategic target. USD/RUB price is falling to 62.49. After that, it may rise to 63.10, but later it is likely to fall to 61.61. 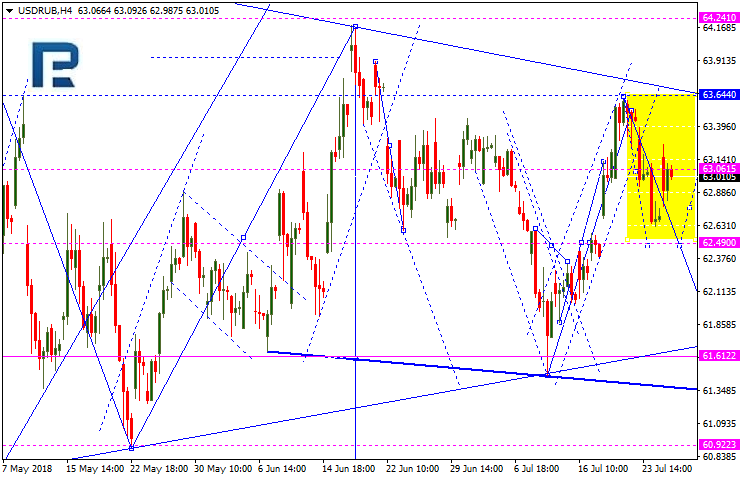 With further breakout, the price may head lower to 60.16. This is a local target. 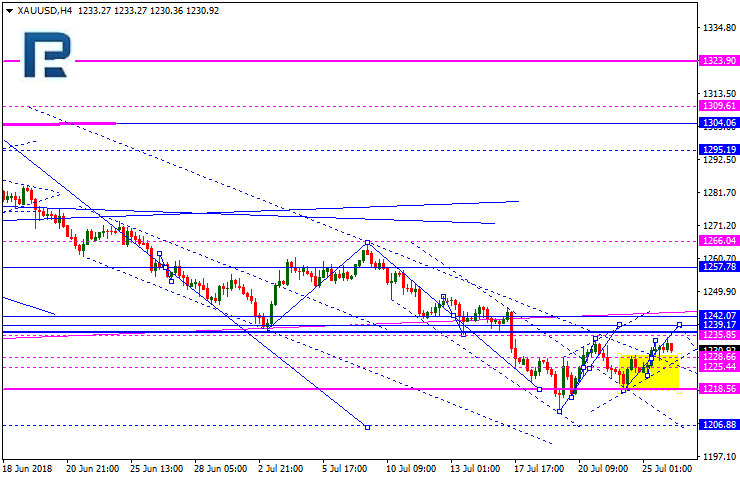 The gold has broken out the consolidation range upwards. We can expect it to grow up to 1239. After that, it may fall to 1225. Once the this level is broken out top down, 1.206 may be reached. Brent oil has broken out 74 upwards. We can expect it to grow up to 75, but later it is likely to fall to 73. Practically, for now, the price is within the consolidation range at minimums. A further drop down to 71 cannot be excluded. All the downward waves are an alternative scenario involving correction. The main scenario is that there is going to be an uptrend towards 82.